We want you to be the first to know about our brand new software release: WinZip 15. Now it's even quicker and easier to zip/unzip files for fast, efficient, and secure uploading/downloading, emailing, and storage! WinZip 15 delivers fundamental architectural improvements, a simplified design, a groundbreaking desktop gadget, and significant new file sharing functionality. 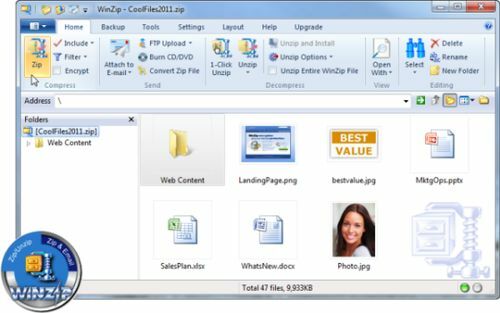 What's New in WinZip 15? WinZip 15 introduces a brand new, high-performance zip engine, a streamlined user interface with a streamlined user interface with an innovative desktop gadget that makes WinZip even easier to use, major file sharing enhancements, and much more. With this unparalleled functionality and usability, no wonder WinZip is far and away the world's #1 utility for file compression, encryption, sharing, and data backup. 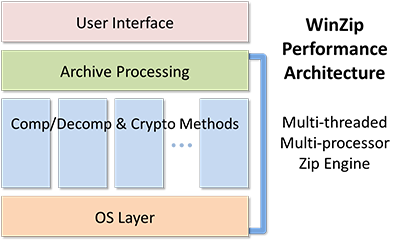 Performance architecture provides a plug-in framework for major enhancements in file compression and encryption. Brand new zip engine provides significantly faster zipping rates while retaining the same high quality compression. In addition to evolutions in user interface design, WinZip 15 introduces a revolution in file compression and file sharing with its groundbreaking desktop gadget. This innovative tool is your express portal for key zipping tasks. Now you can zip, unzip, and email files without opening the WinZip application—simply drag files onto the appropriate WinZip Desktop Gadget tab for instant compression, decompression and email capabilities. With a few easy clicks, WinZip 15 lets you zip and encrypt a set of files as an email attachment, compose an accompanying message, and send the email instantly—all directly from the WinZip window, without opening your email application! The result? You save time and unnecessary steps while ensuring that the files you share are smaller, safer, and more manageable. 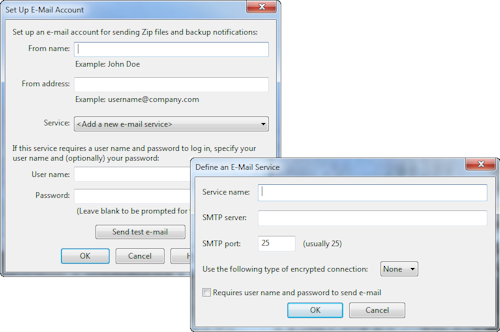 Zip and Email feature lets you create a Zip file and attach it to an email message in one simple process. Once you choose the files to zip and select your zipping options, WinZip opens a message window and attaches your new zip file to it. Simply type a note, address your message, and click Send. Image resizer built into the Zip & Email Plus feature. With just a click, WinZip will resize your high-resolution pictures before attaching them to your email message, so that they send even faster and are optimized to fit standard computer screens. 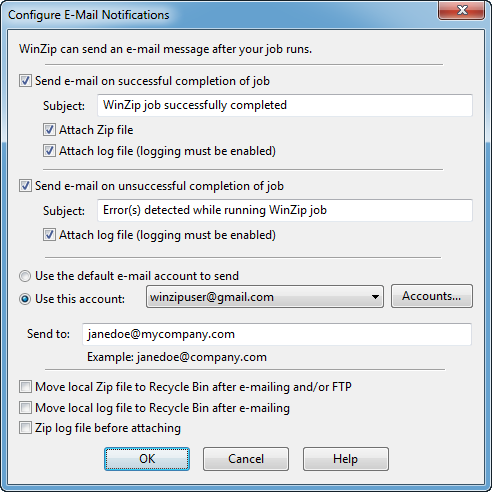 Built-in webmail support now included in all WinZip email functionality to provide maximum utility and flexibility. 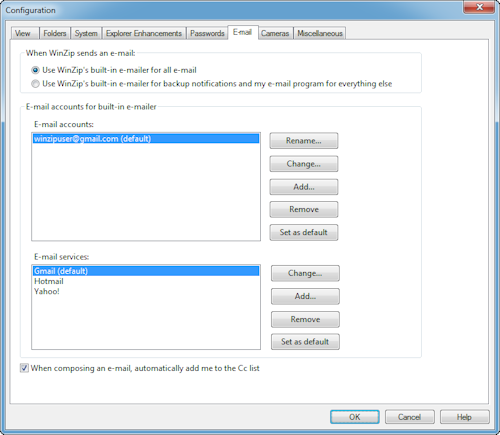 In addition to support for Microsoft Outlook, WinZip 15 comes preset to work with the following popular webmail services: Yahoo! Mail, Gmail by Google, and Microsoft Live Hotmail. Now you can zip, encrypt, and email files from your webmail address, all without having to open a web browser or sign in to your webmail account. Additional support for other webmail services, enterprise mail systems, and individual ISP addresses. Using a different email service? No problem! WinZip 15 provides configuration options that give you the flexibility to email zipped files directly from the WinZip window using virtually any email address, all without opening any additional applications. 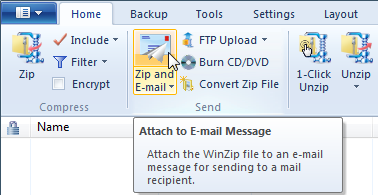 Enhanced email support in WinZip Pro's Backup3 function now allows backup files and log files to be sent automatically upon backup job completion from virtually any email or webmail address that you indicate. Visit the WinZip 15 Product Overview page to learn more, and check out a comprehensive list of WinZip's key capabilities on the Product Feature Comparison page. 1 Zipping speed depends on the types, sizes, and content of files being zipped as well as processor type, processor speed, number of processor cores, and number of processors being used. As such, your results may vary. 2 For Windows 7 and Windows Vista users. 3 Backup capability available only with WinZip Pro.